Welcome at QualityLine – Limousine service and Chauffeur service, your provider of an exclusive, flexible and individual Limousine- and Chauffeur service. Whether you need limousines or vans with driver or a driver on demand, an airport transfer, a roadshow, a long distance transfer, a shuttle-service, coach tours or even a private jet, QualityLine will attend and support you in the organisation and execution of all duties in the range of carriage of passengers. 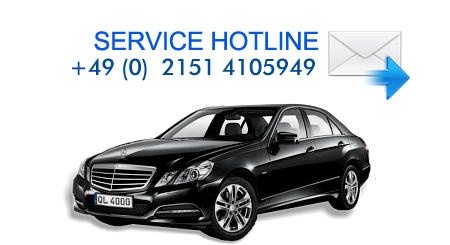 If you need a chauffeur service in Duesseldorf, Berlin, Munich, Hamburg, Cologne, Frankfurt, in any other place of Germany or all over the world, QualityLine will be at your disposal 24 hours a day and 365 days a year.Please get informed about our chauffeur and shuttle service. We are gladly prepared to informing you personally.